The exhaust system on an internal combustion engine may be used to reduce noise and/or increase power. A pressure tapping is also used on many exhaust systems to pressurise the fuel tank and hence allow the engine to operate at any attitude. The basic noise reduction properties of an exhaust system are governed by the available expansion ratio. Lets simplify it and explain what it means. Starting with the cross-sectional area of the pipes (S) and exhaust silencer (Sc). If Sc = 2 x S the maximum loss will be approximately 2dB. if Sc = 10 x S the maximum loss will be approximately 14dB. Therefore, you may reduce the exhaust noise by reducing the basic pipe diameter that forms the manifold and link to the expansion chamber and the final pipe diameter on the outlet of the expansion chamber. The downside is reduced power, reduced maximum engine speed and increased flow noise. Increasing the expansion chamber size will also reduce the noise from the exhaust system. This may be difficult to package. 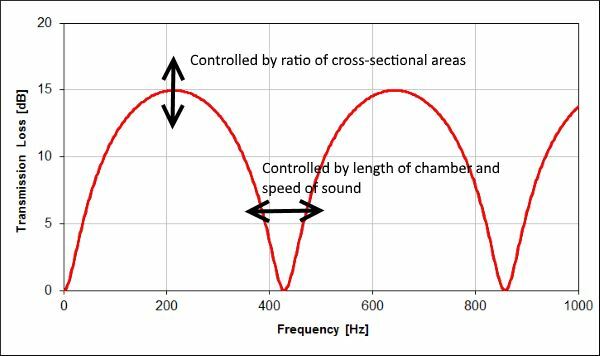 The resonant frequency fn is dependent on the speed of sound (over which we have no control) and the length of the silencer (this we can choose to suit the installation). 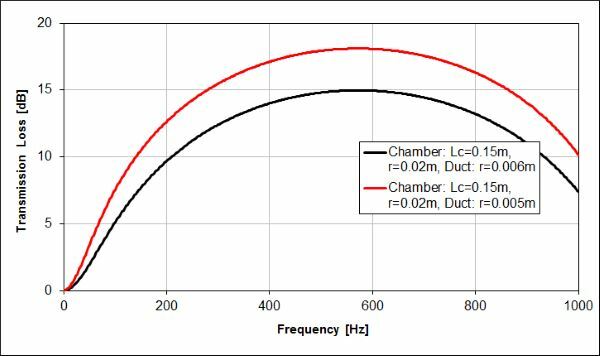 A silencer length of 0.1m will have a resonant frequency of 1000Hz. At this frequency the transmission loss will be at a maximum. 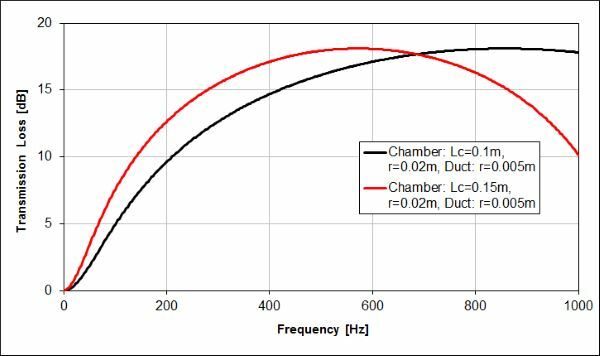 Increasing the expansion chamber length to 0.15m brings the peak attenuation down in frequency. This will improve the attenuation of the engine firing frequency by almost 3dB. A two stroke engine at 10,000rpm will produce an exhaust pulse each rotation of which there will be 10000/60=167Hz. At this frequency the transmission loss of the silencer will be well below it’s maximum. 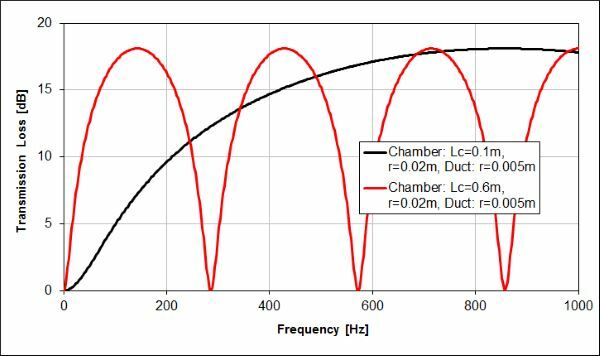 Higher frequency components of the noise will be present in the exhaust noise, but these will have less energy than the basic frequency related to the number of exhaust pulses. Increasing the length of the silencer will increase the transmission loss. 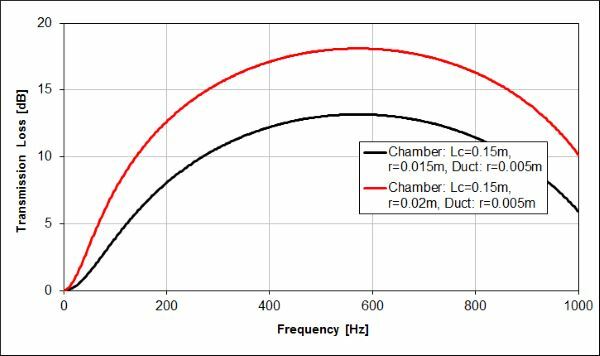 Setting the maximum transmission loss to 167Hz would mean increasing the length of the silencer to 0.6m. A very large model to package this. So some compromise is necessary. Push the pipes into the silencer slightly and increase the effective expansion ratio. Believe me this works, although, backpressure will be increased as well. Offset the pipes such that there is not a direct line-of-site route from one to the next. However, do not place the pipes close to the outer surface of the silencer as this will reduce the effective expansion ratio again. Cascade a number of silencers together. This can be done within one package. Take care to choose different lengths and hence different resonant frequencies. 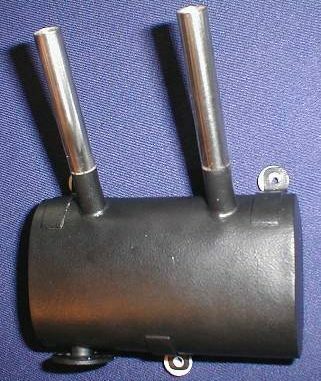 Increasing the silencer volume by a large amount may not reduce the noise of your engine if there are other sources of noise. e.g. inefficient propeller design, engine is mounted directly to the airframe…. Engine Design – a number of short articles discussing aspects of engine design and in particular model engine design.